It’s now legal but many questions surrounding marijuana use remain. What will legalized marijuana mean for you, your community, and your workplace? READY OR NOT, HERE IT COMES. On October 17, Canada will become the second country in the world (after Uruguay) to allow the legal sale of recreational marijuana. The move comes 95 years after lawmakers in the country first banned cannabis. Since nobody knew much about marijuana at the time, it wasn’t really an issue. But what a difference a century can make. When Bill C-45, the Cannabis Act, received royal assent in June, it made headlines across the country and around the world. The move arose from a 2015 federal election campaign pledge by Prime Minister Justin Trudeau to keep marijuana away from underage users and reduce related crime. But what it amounts to is an ambitious progressive experiment, with implications for crime and policing, public health, and big business. Other nations will be watching as Canada deals with all these issues after October 17. They aren’t the only ones. Employers and unions are grappling with what legalization will mean for the workplace. Many workers, including CLAC members, also have questions about what legalization will mean for them and about marijuana’s uses, effects, and testing. Here’s what you need to know. 1. What workplace rules can I expect once marijuana is legal? Legalization will not give employees the right to freely use marijuana in the workplace. Employers will continue to expect employees to show up sober and ready to work. Subject to medical conditions, employers will still be entitled to discipline employees who are high on the job. Employers will have the right to set rules for nonmedical marijuana in the workplace in much the same way they currently set rules for alcohol use. Employers can prohibit its use at work or during working hours and can prohibit employees from coming to work impaired. 2. If I’m caught using marijuana at work, what can happen to me? The same discipline will apply to marijuana impairment as alcohol impairment. You will likely be disciplined under your employer’s progressive discipline policy. 3. If I have a medical condition and am prescribed marijuana as a treatment, can I use it at work? Employers will still need to adhere to the duty to accommodate for medical marijuana. A prescription does not permit impairment, compromised safety, smoking in the workplace, or unexcused absences. Employers may request proof of the prescription and proof that it must be taken during working hours, as well as details regarding frequency, volume, and method of use. “Whatever you might think of studies seen about cannabis being less harmful than alcohol or even cigarettes, the fact is it is bad for the developing brain and we need to make sure that it’s harder for underage Canadians to access marijuana. And that will happen under a controlled and regulated regime." A Centers for Disease Control and Prevention study of cannabis use in Colorado, which legalized recreational use in November 2012, found that 14.6 percent of workers used marijuana in the preceding month. Of those, here are some of the industries in which they are employed. 4. Is there a difference between medical marijuana and recreational marijuana? Yes. The marijuana plant is comprised of over 100 chemicals called cannabinoids. Medical marijuana has higher levels of CBD (cannabidiol), the active compound that can counteract the effects of THC (tetrahydrocannabinol), the psychedelic active compound that causes the high. Medical edible potency is frequently higher than its recreational counterpart. Doctors may prescribe strains that are high in CBD to treat schizophrenia, Crohn’s disease, multiple sclerosis, epilepsy, and other illnesses. Cannabis can be cultivated to have higher concentrations of either THC or CBD. 5. Can my employer test me for marijuana use? Yes, if a policy is in place that establishes a framework for testing for impairment, including triggering circumstances and testing methods, possibly including mandatory independent medical examination in appropriate circumstances. Impairment assessment will very likely pose one of the greatest challenges in the crafting and implementing of policies concerning medical and possibly nonmedical marijuana use in the workplace. Human rights laws do not permit preemployment or random testing for drug or alcohol use or impairment. The federal government has been looking into making drug testing mandatory in safety-sensitive jobs (e.g., pilots), which could be subjected to mandatory testing in the future. 6. Can a test determine if I’m impaired from using marijuana? Unlike alcohol, marijuana can be detected days or even weeks after ingestion, but THC levels do not correspond with impairment levels. No medical test is available currently that accurately or reliably indicates the level of a person’s impairment due to marijuana use. A urine test can detect it for weeks or months after it is taken because THC has over 80 metabolites that are stored in body fat and are gradually eliminated from the body through feces and urine. Marijuana use can be detected in your hair for months—even years—while a saliva test will only detect it within 24 hours. THC and its metabolites are detectable in blood only for a short time, between 20 to 90 minutes, and immediate blood tests can only show that there is impairment but not impairment levels. Even your saintly grandmother has probably heard of Mary Jane, Maui Wowie, or Acapulco Gold. But the slang terms for marijuana run wide and deep. Blame it on 100 years of having to keep it on the down-low. Alfalfa, Bambalachacha, Cabbage, Downtown Brown, Escoba, Fuzzy Lady, Giggle Weed, Holy Grail, Indian Hay, Jolly Green, KGB, Little Green Friends, Mother, Northern Lights, O Boy, Parsley, Queen Anne’s Lace, Rope, Sasafras, Texas Tea, Valle, Wake and Bake, Yerba, Zip. 7. What sort of short term effects will using marijuana have on me? Your brain produces its own cannabinoids that are similar to the ones found in marijuana. It does this via its endocannabinoid system, which is important in terms of functions such as emotion, sleep, appetite, and movement. Cannabinoids interact with specific receptors within your body, activating CB1 receptors within your nerve endings, nervous system, brain, and CB2 receptors that are found in your immune system. When you ingest marijuana, THC attaches to your cannabinoid receptors to activate the endocannabinoid system. This in turn slows your reaction times, impairs your judgment, and affects your memory. CB1 receptors are found within your brain, which is why you feel high. Recreational cannabis is going to be big business. Many investors have already made huge profits from cannabis stocks, and a big question for them is whether the bubble bursts or the value keeps rising. 8. Are there long term effects to using marijuana? Yes. Long term marijuana use has a number of serious long term effects including withdrawal, effects to the brain, and other effects. decreased math and verbal skills. flashbacks of drug experiences while not using. 1923 — Cannabis is made illegal under the federal Narcotics Drug Act Amendment Bill. 1937 — The first marijuana seizure is made by Canadian law enforcement. 1962 — Cannabis gains popularity and the number of convictions jumps from 25 between 1930 and 1946 to 20 cases in 1962 alone. 1968 — Convictions jump to 2,300 as marijuana use increases, particularly among college students and the hippie counterculture. 1972 — The Le Dain Royal Commission of Inquiry in the Non-medical Use of Drugs releases its report recommending that the government remove criminal penalties for the use and possession of cannabis, although the report does not recommend legalization outright. No steps are taken. 2000 — The Ontario Court of Appeal overturns the conviction of Terrance Parker, who was arrested for possession, cultivation, and trafficking in 1996 after he is caught growing cannabis to control his epileptic seizures. The court rules that the prohibition of cannabis use infringes on Parker’s right to life, liberty, and security of the person. 2001 — The federal government enacts the first medical marijuana law, the Marihuana (sic) for Medical Access Regulations (MMAR), allowing licensed patients to grow their own cannabis or buy it from licensed growers. 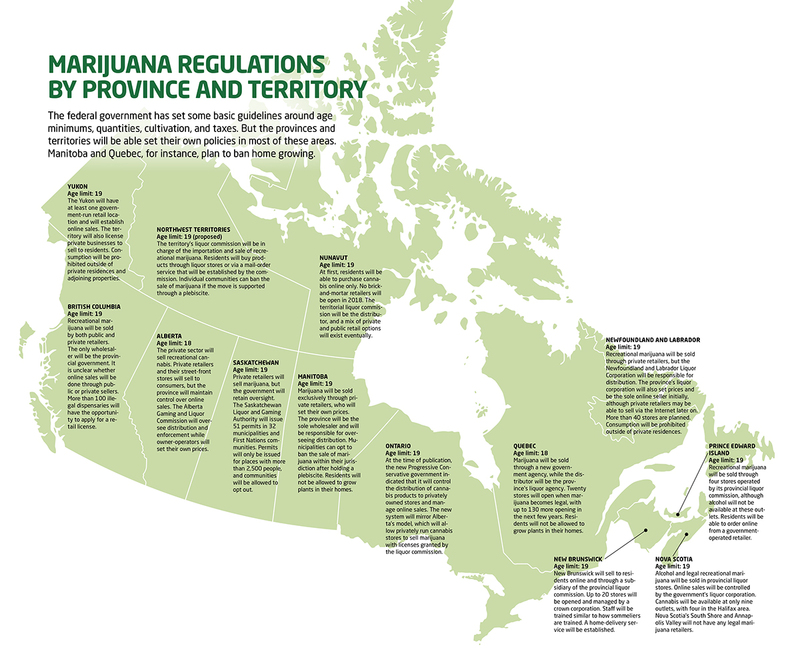 2003 — The Liberal government of Jean Chrétien introduces the first federal marijuana decriminalization measure, reducing the possession of up to 15 grams to a civil fine. The bill dies, mostly due to pressure from the US Drug Enforcement Administration. 2006 — Prime Minister Stephen Harper announces a new national antidrug strategy, imposing mandatory prison sentences on cannabis dealers. Anyone charged with growing more than 500 plants faces a two-year minimum sentence. Maximum penalties for producing cannabis increase from 7 to 14 years in jail. 2018 — Bill C-45, the Cannabis Act, is passed and goes into effect on October 17, legalizing the possession, use, cultivation, and purchase of limited amounts of cannabis by adults 18 years of age and older nationwide. “C-45 marks a wholesale shift in how our country approaches cannabis. It leaves behind a failed model of prohibition, a model that has made organized crime rich and left our young people vulnerable. In its place we will have a new system that will give adults the opportunity to purchase and consume cannabis legally from authorized suppliers." 9. Can I become addicted to marijuana? Continued use builds up your tolerance and can lead you to consume stronger drugs to achieve the same high. When the effects start to wear off, you may turn to more potent drugs to rid yourself of the unwanted conditions that caused you to use marijuana in the first place. Marijuana itself will not lead you to use other drugs. Almost one in ten people who use marijuana will eventually become dependent on it, according to findings from the National Epidemiologic Survey on Alcohol and Related Conditions. Half of people who eventually met the criteria for marijuana dependence did so within four years of their first use. 10. I’ve heard that using marijuana is like drinking alcohol. Is that true? Both alcohol and marijuana impair driving abilities and lead to an increased number of accidents. You can die from alcohol poisoning but you cannot overdose on cannabis. Alcohol makes you gain weight because of the calories, but there is no ingredient in cannabis that causes weight gain—on average, regular users have lower weights. Alcohol is highly addictive whereas cannabis addiction is still controversial, and the physical symptoms are nothing like those of other drugs. You can die from alcohol withdrawal. Combustion of marijuana fills the lungs with toxins and irritants—more tar is produced from a joint than an equal-sized cigarette. Plus, it can be incredibly harsh on the throat. Many alternative methods are available for ingesting marijuana that offer all the therapeutic benefits of cannabis without the negative side effects to overall health. Vaping – The chemical compounds in marijuana vaporize at a much lower temperature than traditional combustion through smoking, and it is much easier on the lungs. Dabbing – A method of flash-vaporization in which cannabis concentrates are dropped on a heated water-pipe attachment and inhaled for intensely potent effects. Edibles – The diversity of marijuana edibles is quickly and vastly expanding. Because of the digestive process, edibles take much longer to kick in and can have intensely psychoactive effects. Oils – Ingestible oils most commonly come in capsules or plastic applicators, either of which can be consumed directly or added to food or drink. Like edibles, ingestible oils can induce powerful effects that take a while to kick in. Tinctures – Infused liquids that extract cannabis compounds using an alcohol soak are applied directly under the tongue. Tinctures enter the bloodstream immediately, allowing for fast-acting effects and better dose control. Topicals – Cannabis-infused lotions and balms applied directly to the skin can provide localized relief of pain and inflammation. Topicals treat symptoms without any psychoactive effects. 11. Can I grow, share, or sell my own marijuana? The new law limits the amount that you can grow for personal use to four plants per household. Some constitutional issues may arise around growing it in Quebec and Manitoba as both provinces have indicated they will not allow residents to grow their own marijuana. You can share marijuana but only with those over age 18. Licenses are needed for any and all distribution. 12. Can I take marijuana with me when I travel? The legalization of cannabis in Canada will not change border rules. Taking marijuana in any form into or out of Canada will remain illegal and can result in criminal penalties both at home and abroad. Transporting medical marijuana across international borders also remains illegal. You may take medical marijuana on flights within Canada, but you must present a prescription and be carrying less than 150 grams. The oldest recorded term for the marijuana plant is the Greek word kannabis. But the oldest stash of marijuana, some 800 grams, dating back 2,700 years, was found in a tomb in northwestern China in 2008. It was reportedly a little dry. The pot was clearly grown for its psychoactive effects—not to make clothes or for food. Cannabis has also been found in ancient Egypt and other ancient sites. The Chinese stash was particularly potent, with a high THC content, according to tests. Scientists also tried to grow some “China Gold” from seeds found in the stash, but they could not get the seeds to germinate.